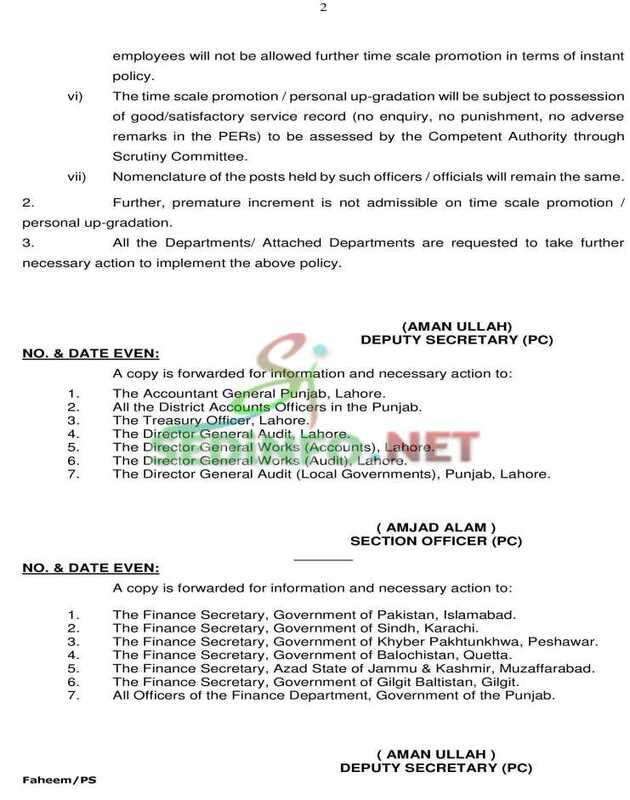 Government of Punjab issues Time Scale Promotion Notification for Punjab Government Employees. It’s the notification for which Punjab employees were waiting for. It was also one of basic demands of Punjab Government employees, particularly School Education Department (SED) employees. Therefore, now Government has issued notification regarding Time Scale Promotion Notification for Punjab Government Employees. (Jump to download official notification’s file). All the Punjab Government employees will get time scale promotions, according to the following terms & conditions! To officers/officials, who have served more than 10 years of regular service in the same scale, but could not be promoted despite having promotion channel, due to a few number of posts in the upper tier. The officers in BS-20 and above will not be allowed time scale promotion in terms of instant policy. The employees upto BS-15 who availed time scale promotion once or twice by virtue of Finance Department’s policy letter No.FD.PC.40-80/2015 dated 26.07.2017 will continue to be governed by the policy ibid. Such employees will not be allowed further time scale promotion in terms of instant policy. The officers originally appointed in BS-16 and above against stagnant posts (having no promotion channel) will continue to be governed by the policy letter No.FD.PC.40-12/2017(B) dated 14.02.2019. Such employees will not be allowed further time scale promotion in terms of instant policy. The employees in BS-1 to BS-4 will also be governed by the policy letter No.FD.PC.39-14/77(Pt.IV)(APCA/2008)(Provl.) dated 21.06.2017. Such employees will not be allowed further time scale promotion in terms of instant policy. The time scale promotion / personal up-gradation will be subject to possession of good/satisfactory service record (no enquiry, no punishment, no adverse remarks in the PERs) to be assessed by the Competent Authority through Scrutiny Committee. Nomenclature of the posts held by such officers / officials will remain the same. Further, premature increment is not admissible on time scale promotion / personal up-gradation. All the Departments/ Attached Departments are requested to take further necessary action to implement the above policy. You can also download complete official notification from following download button. 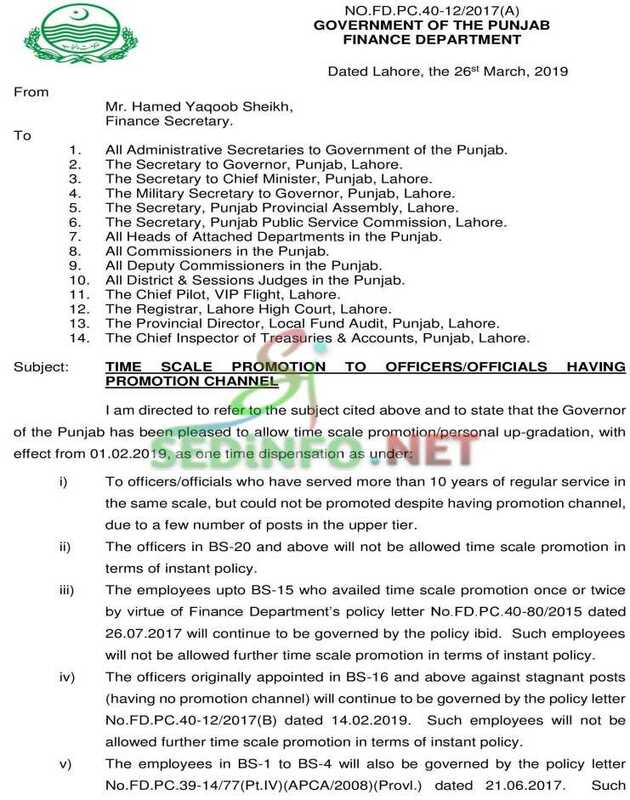 That’s all about Time Scale Promotion Notification for Punjab Government Employees. In case of any query, feel free to comment below or contact us.